My yoga instructor hosted a labyrinth meditation walk on Saturday as a way to begin the Lenten season and extension of our studio study of the First Chakra. I have participated in these meditation walks three times and each time I have had a profound spiritual experience. I try not to prepare, or have an intention, I just show up and walk. A large group of us met on the Wesley Center grounds. As our group filed along the walking path in silence and I waited my turn to enter the opening of the labyrinth, I tried keep my mind clear. As I started walking the path, I focused on my senses. I could smell the rain coming, feel the humidity on my skin, hear the leaves crunching, the wind blowing in the trees, an occasional bird singing. I started looking for a memento, just something to hold, but I wanted it to be meaningful. A leaf got stuck in my sandal. I was walking too fast anyway, so I bent to pull the leaf out and kept it as my first token. It was a reminder of the cycle of life. By the time I reached the outside of the maze, I had collected a few more tokens and was deep in thought. My husband, Chris, was with me and walking behind me. I began to think of all the people who are most important to me and a few overwhelming thoughts set in. I could feel a lump in my throat and the tears start to well up. The mind’s job is to keep us safe. Deep self-awareness is not “safe”. My initial reaction to those thoughts was to make a joke about it, to diffuse it. So, I looked at the little bits of ephemera in my hands and thought “A leaf, a rock and a stick walked into a bar…”. I continued walking and when I reached the center and was still for a few moments, things became very clear. My fears are what keep me from being present…fear of death, fear of being alone, fear itself. How much time have I wasted worrying about the past and what will come in the future? I need to be here, now, enjoying this moment. Chris and I sat on a bench by the lake for awhile after our walk. We had a deep discussion about our experiences and a good cry. Chris said I needed to let those emotions bubble up and out like champagne! I felt cleansed, and illuminated with new understanding. WOW…the answer was there all the time (pointing to my chest), I just had to look. 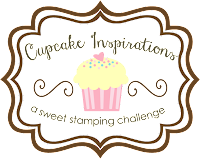 My post is part of the new Cupcake Inspirations challenge. The challenges are biweekly and this color challenge is “white out”. I did a little research on the symbolism of dragonflies and yoga and discovered that the dragonfly is believed to bring happiness, new insights, new beginnings and exemplifies the virtue of living IN the moment and living life to the fullest. It is a symbol of prosperity, good luck, strength, peace, harmony and purity. A dragonfly’s wings and body are iridescent. This property is believed to be “the end of one’s self created illusions and a clear vision into the realities of life”. I just happened to have some iridescent embossing powder to embellish the stamp images. I love how all of these elements came together! There’s a gift certificate from Poppy Stamps for our randomly chosen winner, so be sure to join the Design Sweeties this week and make something beautiful to share! I’ll look for you in the gallery! Previous Post Keep the Wheels Turning! Gorgeous – card and story! Thank you Pam, I’m glad you like it!